My husband and I are trying to decide on three different places in Europe we've never visited, and while we don't have any friends who have visited each of the three, we do know that its highly likely multiple travelers on this forum have visited all three and can tell us what they think. Sometime during the second or third week in June, we will fly from Baltimore to Madrid and visit a close friend who lives there for four days. We have visited Madrid/Central Spain/Barcelona in the past. Fortunately budget is not a constraint, nor is the distance to each one. We also know that likes and dislikes are highly subjective....but would like to hear the thoughts of anyone who would care to give us their opinion, and has visited all three or even two of them. I've been to Lisbon and to Ljubljana. Personal taste - but I liked Lisbon...but LOVED Ljubljana. I've been there four times. Slovenia is just a cute little undervisted country with bit of Austrian, Slavic, and Italian influences mixed together. Granted, Ljubljana is not exactly undiscovered anymore, but it's still not on many American tourists' agendas. It's just not on the way to/from anywhere else, really. That's one reason I like it. I last visited Ljubljana almost two years ago. I visited Lisbon for the first time last May. It's certainly a city with character, but it's also mobbed with tourists now, and the city seems almost unable to handle them all. There is lots to see, way more than in Ljubljana by far, and the public transportation - the trams and buses - can barely keep up. Ljubljana is more about charm - and it's tiny compared to Lisbon. It's got a tiny little river running through the middle of town, beautiful architecture, a real castle on the hill - but it's still a vibrant place, a university town. There are neat little towns near Ljubljana and some neat attractions. Lake Bled is the most obvious tourist stop, surely the most highly visited spot in the country. It's quite built up. Lake Bohinj nearby is much bigger and less developed, more of a "back to nature" experience. Many people do the "Julian Alps Loop" drive up into the mountains via the Vrsic Pass, up a windy road with many hairpin turns, and down into the Soca Valley. I also enjoy the drive from the town of Skofja Loka (between Ljubljana and Bled) to Bled through the mountains, via Jamnik and Kropa - very pretty with some neat stops here and there. Slovenia has a tiny coastline compared to Portugal's for sure. The little seaside town of Piran is a real gem. The Venetian bell tower makes its heritage obvious. The area is still officially bilingual Slovenian-Italian. You could consider adding a dip down to the Istrian peninsula in Croatia from there - with 7-8 days, you would probably have the time. Rovinj is another delightful seaside town, old (still active) fishing village, though it's also become a tourist magnet. Things should be pretty busy there by June; I visited in early May when it was quieter. I've been to all three areas. I would eliminate Sicily from consideration on this trip because of the substantial risk of really hot weather during your timeframe. I think your odds are better in Slovenia or Portugal. I've been to #1, well Sicily including Palermo but skipped Taormina. Loved Sicily, not so much Palermo itself. Sicily is better with a car. I'm planning a trip to #3 and all my research says it's going to be excellent. Though I'm planning to rent a car but not for the area you're planning. It seems easy to travel between towns by train and bus. In mid June, I'd expect weather in Portugal to be pleasant and for Sicily to be a little too hot for my comfort. Andrew ---- thanks for a great reply! Acraven ---- thanks for the heads up! My husband and I both grew up in Rancho Mirage.....and we both absolutely love The DC metro area summer nights when the temps stay 75-80 degrees and muggy, even at night! Haven't been to Sicily, but #2 and #3 are both great. My preference is Portugal. We love the country and its people. If you are going to Madrid, you can take the train to Lisbon. Lisbon is good for 3-4 days, more if you do day trips to Evora, Sintra, Navarre and Obidos. You don't have time to visit Porto, but perhaps you can plan a visit to that city and take a Douro River cruise. I have been to all three and don't think you can make a bad choice. Obviously Slovenia is the most different from the others as it's more northern European in look and feel. While there are differences between Portugal, Sicily and Spain there are similarities as well. I've been to all of them in June/July and didn't feel any of them were 'too hot'. You mention Palermo/Taormina for Sicily - are you interested in the rest? To get a good overview of Sicily takes at least 10 or more days, but if you are content with just one half then a week is fine. I would suggest you also add in Siracusa. For Portugal your time frame is fine for Lisbon and central Portugal, don't try to go all the way up to Porto or down to the Algarve just 7-8 days. The time frame is also good for Slovenia. In addition to Lake Bled as a day trip (or side trip), I loved the coastal town of Piran. I did not have a car at all for Slovenia. For the other two it would help to have one depending on exactly what you want to do but possible without one. Sicily if you just stick to Palermo, Siracusa and Taoramina you could get by without, for the rest of Sicily you'd need a car unless you had tons of time. Before we went, we heard that Lisbon is great. We were underwhelmed, although we did enjoy Sintra. Lisbon is on my "ok to miss" list. I have not been to Sicily. We are going to Slovenia this September(but not Ljublijana) and that entire area, including Croatia and Montenegro, appear to have wonderful natural scenery. Wow! Thank you all so far! Isabel --- Your photos are wonderful and make it harder to pick. All three are very beautiful. Cala---- What about Libson underwhelmed you? We do have a friend who has been to Portugal, traveling for work/business. She told us that she had traveled there for the first time in 2007......and that it was great and how cheap it was.....and the quality of the food, etc. Almost as if it was third-world type inexpensive! She went back in 2016 and basically said what Andrew is saying : that tourists had now found the place and it was more expensive, much more crowded.....and more hectic in terms of public transportation. We have also talked to other friends who travel to Europe from time to time and tell us that Portugal is tops on their bucket list. Remember when the Macarena came out and everyone liked it? It seems that Portugal is the Macarena for Europe travel destinations for many Americans. Since you will already be in Spain, I wanted to throw this idea out there, why not visit Northern Spain, which is often referred to as "Green Spain". The summer months are the perfect time to visit too. It's quite the contrast compared to Southern/Central Spain, and looks more like Ireland mixed in with the Alps. From medieval villages, to the picturesque wine regions, the emerald waters of Bay of Biscay, the culinary delights of the Basque country, and the towering jagged peaks of the Picos de Europa; I feel Northern Spain has something for everyone and is less touristy than the rest of the country. 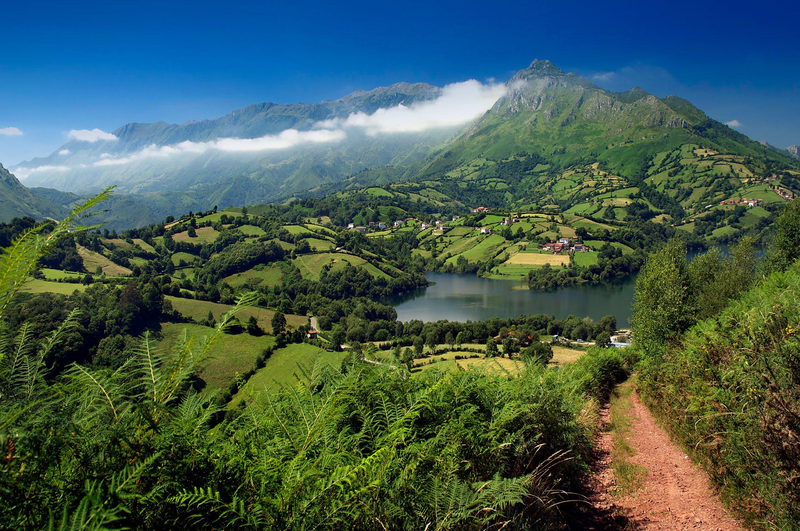 With 8 nights, one can hit the highlights of the Basque Country, Cantabria, and Asturias. We've been to all three. We concur, likes & dislikes are subjective. That said, each place is unique in itself and brings special memories. Most recently we were in Ljubljana. It made it's mark as our newest favorite city! As Andrew remarked we LOVED Ljubljana. We spent 4 nights there and could have easily stayed longer. The charm, the kind people, the cuisine, pedestrian friendly..... It's a place we would revisit. Ah, Sicily! We stayed on the Eastern side and LOVED Taormina, Siracusa/Ortigia, & Baroque towns of Noto, Ragusa & Modica. The history, architecture, culture, cuisine will be in our memories forever. It's magical. We would revisit and spend several weeks exploring areas we missed. Lisbon, surrounding areas. We enjoyed the RS Portugal Tour! We loved Portugal just as much as the other places mentioned. After our Portugal tour we flew to Madrid x4 days, then to Barcelona x4 days. This could easily fit the Lisbon/surrounding area x7-8 nights. If weather is a consideration, that might make a difference in your determination. We visited all places in September. We experienced warm weather. That was fine for us. Can't speak to June weather. You can't go wrong with the areas under consideration. For us, every place we visit is our favorite at the time. Enjoy your planning! Kathy, I have been to all 3 of these locations between 2014 and 2017, and enjoyed them all, friendly people and good infrastructure for visitors in each one. I very much enjoyed Lisbon, great neighborhoods, a number of sites and museums, and delicious food. Both Sintra and Evora are very nearby, and merit a couple of nights each, rather than just a day trip. It’s my first choice of your 3. I also enjoyed Ljubljana, but it is smaller with less to explore, and I think you would want to explore more places well beyond the capital city. I think the cuisine of Ljubljana is considerably less special than the other 2. Sicily is wonderful, but as others have mentioned, I think at least a 2 week visit is necessary to explore various of the many diverse sites and highlights spread across the island. You mention Palermo and Taormina, but if you limited yourself to those 2 spots, you wouldn’t really experience the diversity of Sicilian history and life. Delicious food and wine in Sicily, of course. Carlos's idea is excellent. I spent a good chunk of the summer of 2016 in northern Spain. It's very interesting and the weather was very pleasant after dealing with what I experienced in Extremadura. Andrew made a great point about Ljubljana being NOT on the way to other places. Of the three, which are you least likely to get back to on another trip? Is there one that is substantially cheaper or easier to fly to than the others (including the flight home)? I know you said these issues were not constraints - but they can be great tie-breakers! Wow......we just added a reply and it disappeared? There's probably no wrong choice. Some of this is purely personal taste and preference. I know people who loved Portugal as much as I loved Slovenia. I've now come to accept that having been a lot of places in Europe by now, I'm not going to love all of them equally - but I still find it worth visiting them. There are places in Portugal I hope to return to some day, as with most other countries I've visited in Europe. But Slovenia (and to some extent Croatia and also Italy) will be my favorite "return to" place. We should all have one of those after a few trips. Thanks Andrew and all who responded. We've narrowed it down to Ljubljana and Sicily, based on the fact we can return next year and make the Basque Country and Portugal into one two to three week trip. I'd probably choose Portugal because you are already starting in Spain. All three choices should be on your list to visit at some point. While in Madrid, make a day trip - at least - to Toledo. So much better IMO, and more affordable, than Madrid. Ironically, I'm also planning a trip to Croatia/Slovenia for early September (after Ireland in May).